The first League match of the year, against Bedfordshire, took place at Frilford Heath on 23rd June. Playing round the Blue Course the team got of to a good start by winning the morning foursomes 3-1. The County Captain Matthew Briggs and Kevin Freeman had an outstanding win against this year’s winners of the Sunningdale Foursomes – John Kemp and Mark Wharton. Three down after 9 they came back strongly to win 2/1. Both the pairings of Craig Buttivant and Clive Bowler, Steve Barwick and Tom Lawson posted wins by large margins. In the afternoon after a struggle, the top two games featuring Kevin Freeman and Steve Barwick, produced 1½ points and after the Captain’s win and another good performance from Craig Buttivant, the match had been won. Tom Lawson just lost out the to John Kemp by one hole and David Addison recorded another win before Ashley Walton and Clive Bowler both halved their games for the team to come out comfortable winners by 8½-3½. Team at Frilford Heath: David Addison (West Berkshire), Steve Barwick (East Berkshire), Clive Bowler (Oxford City), Matthew Briggs (Frilford Heath), Craig Buttivant (Gerrards Cross), Kevin Freeman (Stoke Park), Tom Lawson (Ellesborough), Ashley Walton (Frilford Heath). The second League match of the year, against Hertfordshire, took place at Old Fold Manor on 14th July. The team got off to a poor start in the morning foursomes and what should have been at least two games all at lunch turned into a deficit of 1½-2½. The only win coming in the morning was from Tom Lawson (Ellesborough) and David Addison (West Berkshire) who played very well to take their point. The afternoon was a different matter as the players stepped up a gear and with 4 points coming from the first 5 matches a win now seemed a possibility. Kevin Freeman (Stoke Park) had won comfortably as had Craig Buttivant (Gerrards Cross). David Addison (West Berkshire) collected maximum points for the day, as did Tom Lawson (Ellesborough). The last two games came to the final 2 holes in a favourable position it was left to Mark Housego (Gerrards Cross) to clinch the match as he took the 17th to win his game. Clive Bowler (Oxford City) who had been nursing a tendon problem all day capped the afternoon by gaining a valiant half in the last game to enable the team to come out winning 7-5 and to top the League and remain as the only undefeated side in the competition. 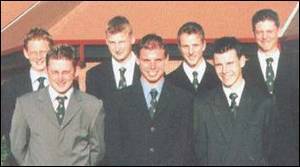 Team at Old Fold Manor: David Addison (West Berkshire), Clive Bowler (Oxford City), Matthew Briggs (Frilford Heath), Craig Buttivant (Gerrards Cross), Kevin Freeman (Stoke Park), Mark Housego (Gerrards Cross), Tom Lawson (Ellesborough), Ashley Walton (Frilford Heath). Team at East Berkshire: David Addison (West Berkshire), Brian Davies (Parasampia), Mark Greenwood (Hadden Hill), Paul Lines (Windmill Hill), Robin Long (Windmill Hill), Peter Newton (Parasampia), Stewart Scott (Castle Royle), Andrew Sheffield (Brailes). The Team then went on to play the first of the new friendly matches against neighbouring Counties, playing Northamptonshire at Rye Hill on Sunday 28th April. We lost this match by a narrow margin against an almost full strength Northants team. Team at Rye Hill: Paul Barrow (Studley Wood), Spencer Hallam (Tadmarton Heath), Nathan Hammonds (Farnham Park), Andrew Mason (Tadmarton Heath), Paul Lines (Windmill Hill), Robin Long (Windmill Hill), Martyn Palmer (East Berkshire), Andrew Sheffield (Brailes). The next match took the Team away to Dudsbury Golf Club to play Dorset. Again, the opposition was just too strong for us and we lost by just one point. Team at Dudsbury: Paul Barrow (Studley Wood), Nathan Hammonds (Farnham Park), Paul Lines (Windmill Hill), Robin Long (Windmill Hill), Martyn Palmer (East Berkshire), Austin Siggers (Studley Wood), Andy Vaughan (Windmill Hill), Dean Yates (Burford). The County Team also played Windmill Hill on 23rd June and won the morning fourball games by 3-1. In the afternoon the County only dropped half a point in the first 6 games and eventually came out winning 8½-3½. After 4 years of this fixture the ‘series’ stands at two matches all. Team at Windmill Hill: Paul Barrow (Studley Wood), Mark Greenwood (Hadden Hill), Paul Heselden (Harewood Downs), Alex James (Buckingham), Paul Lines (Windmill Hill), Bob Mann (Frilford Heath), Austin Siggers (Studley Wood), Dean Yates (Burford). Team at Woburn: John Field (Buckingham), Mark Greenwood (Hadden Hill), Paul Heselden (Harewood Downs), Alex James (Buckingham), Paul Lines (Windmill Hill), Paul Lines (Windmill Hill), Martyn Palmer (East Berkshire), Peter York (Harewood Downs). Team at Harleyford: David Addison (West Berkshire), Robert Christian (Beaconsfield), Lee Gauthier (East Berkshire), Matthew Haddy (Bicester), Stephen Richards (Chartridge Park), Andrew Sheffield (Brailes), Daniel Taylor (Woburn), Ashley Walton (Frilford Heath). The Colts went to Finchley in North London for their second League Match against Middlesex on Saturday 29th June. None of the Team had played on this James Braid designed course which has extremely fast undulating greens which put an absolute premium on positioning approach shots. Often the only way to keep the ball on the green, downhill and downwind, was to hole it! The morning foursomes got off to a good start with Geoff Harris (Reading) and David Addison (West Berkshire) never looking in trouble as they won 3/2. Lee Gauthier (East Berkshire) and Andrew Sheffield (Brailes) were also well up in their game before they let a couple of holes slip before finally closing out the opposition 2/1. The best result though, came from Ashley Walton (Frilford Heath) and Barry Mann (Frilford Heath) who made a dramatic comeback from 4 down to win by 2/1. This result would effectively give the side the cushion it needed in the afternoon singles. These started with Lee Gauthier (East Berkshire) making plenty of birdies as he took the first game 4/3 and shortly after David Addison (West Berkshire) also won 4/3 and we now just needed 1½ more points to secure the match. Barry Mann (Frilford Heath) was dormy in his game and Andrew Sheffield (Brailes) who was playing in the anchor spot at number 8 looked set for a win. However, it was left to Kevin Tilbury (Stoke Park) to clinch the match on the 18th with a solid par and to win his game before Barry and Andrew added wins to leave the side with an 8-4 victory. Once again the Colts lead the English Golf Union South East Group North League and next play Bedfordshire in a rearranged fixture on 27th July at Bedford and County. Team at Finchley: David Addison (West Berkshire), Robert Christian (Beaconsfield), Lee Gauthier (East Berkshire), Geoff Harris (Reading), Barry Mann (Frilford Heath), Andrew Sheffield (Brailes), Kevin Tilbury (Stoke Park), Ashley Walton (Frilford Heath). The Juniors played an under 16’s game against Hertfordshire at Hadley Wood on Sunday 9th June and for the first time in a number of years won the fixture. The morning foursomes went in the Boys’ favour by just one point with Joe Murphy (Stoke Park) and Will Roebuck (Woburn) registering an emphatic 7/6 win. In rainy conditions in the afternoon, play was not easy but there were fine performances from a number of players. Laurence Eltham (Goring & Streatley) had the best result with a 6/5 win and Mark Hall (Oxford City) played very well to secure a win by 3/2. Haydn Brooks (Woburn) who was captaining the side and Adam Hinkins (Chiltern Forest) both took maximum points on the day and the overall win by 10½-7½ gives us encouragement for the future. Team at Hadley Wood: Adam Birdseye (Hazlemere), Haydn Brooks (Woburn), Sean Cooke (Henley), Laurence Eltham (Goring & Streatley), Mark Hall (Oxford City), Ben Harwood (Hazlemere), Adam Hinkins (Chiltern Forest), Joe Murphy (Stoke Park), Will Roebuck (Woburn), Craig Taylor (Woburn), Daniel Taylor (Woburn), Chris Tellett (Woburn). Team at Goring & Streatley: Brian Berney (Gerrards Cross), Bryan Claringbold (Frilford Heath), Rod Crisp (Ellesborough), David Doodson (Temple), David Hearn (Ellesborough), Duncan Forbes (Sonning), David Lane (Goring & Streatley), Anthony Parsons (Denham), David Stevenson (Burnham Beeches), Tom Wallis (Ellesborough). The second League match was played against Bedfordshire on Tuesday 11th June at The Bedford. Just four of the victorious side at Goring & Streatley were plying in this match but the apparent strength in depth of the squad enabled the Captain, Tom Wallis, to still field an excellent team. Notable victories went to Dave Hearn (Ellesborough) who won by the best margin of 8/7 and Peter Batchelor (Woburn) who was 3 up with 6 to play before he lost 4 in a row to look like losing. He came back in dramatic fashion by getting a hole in one at the 202 yards 17th and making a birdie at the last to record the win that seemed certain an hour before. Team at The Bedford: Brian Berney (Gerrards Cross), Peter Batchelor (Woburn),Tim Clutterbuck (Beaconsfield), Rod Crisp (Ellesborough), David Hearn (Ellesborough), Tony Finch (Flackwell Heath), Duncan Forbes (Sonning), Peter Franklin (Stoke Park), Ken Proctor (Burnham Beeches), Jim Walkinshaw (Denham). The final League match of the season took place at Highgate on Tuesday 2nd July against Middlesex. Despite the lack of a practice round the team seemed quite at home on the North London course. Jim Walkinshaw (Denham) was 2 under par as he took the honours for the biggest win of the day, David Doodson (Temple) won against a former Portuguese amateur champion and David Lane (Goring & Streatley) won the battle between English and Welsh Internationals. Duncan Forbes (Sonning) had the distinction of gaining the point that won the match and enabled the team captained by Tom Wallis (Ellesborough) to take the EGU/SE Group North of the Thames League title. They now look forward to playing the winners of the South of the Thames League later in the year. Team at Highgate: Bryan Claringbold (Frilford Heath), David Doodson (Temple), David Hearn (Ellesborough), Duncan Forbes (Sonning), David Lane (Goring & Streatley), Peter Franklin (Stoke Park), Ron Nightingale (Frilford Heath), Paddy Nolan (Ellesborough), Ken Proctor (Burnham Beeches), Jim Walkinshaw (Denham). The BB & O Club Scratch and Handicap Foursomes Championships was held at Winter Hill Golf Club on Friday 3rd May. The Scratch Championship was contested by 29 teams and the morning round saw some fine golf, with the pairings from Hadden Hill and The Buckinghamshire leading the way at level par with David Stevenson and Ken Procter (Burnham Beeches) just a shot behind. The afternoon conditions were a little worse but thankfully the promised thunderstorms failed to materialise. A fine back nine of 3 under saw the defending pairing from Windmill Hill set the mark at 150 but David Summers and Ian Bound (Oxford City) made an excellent birdie at the last to take the Championship by just one shot. 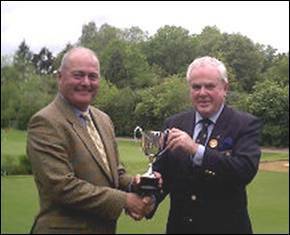 The BB & O Penfold Trophy was played at Denham Golf Club on Saturday 11th May. 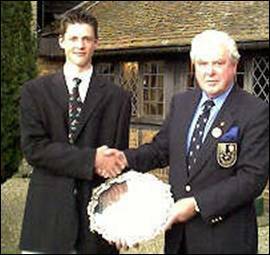 The Penfold Trophy is also the qualifying event for the Amateur Championship, which is being held at Beaconsfield Golf Club, who also celebrate their Centenary, this year. Players with handicaps from 2.0 to 5.4 must qualify from this tournament. 90 players entered the event and those on and above 4.5 handicap were balloted out. There were 12 places available to qualify for the Amateur and all players on 149 or better will go through to the main event, one player on 150 and with reserves coming from the others on 150. 66 players contested the Championship on a wonderfully prepared course playing quite trickily in a testing wind. Nevertheless, with a field all determined to qualify for the Amateur Championship, scoring was excellent in the morning with 18 players at 75 or better, with Robert Hart (Harewood Downs) heading the field with a fine 69 closely followed by Peter Murray (Datchet) and Andy Vaughan (Windmill Hill) with 71. The afternoon golf was excellent and some 30 players would shoot 75 or better. One of the earlier afternoon starters, 15 year old Adam Hinkins (Chiltern Forest), had a very steady front nine of level par but produced three birdies in 6 holes to lead by two. Despite dropping a shot at the very difficult 9th (his 18th) he set an excellent target for the rest of the field. James Peck (Frilford Heath) was continuing his very steady play and David Summers (Oxford City) was again in the reckoning. Unfortunately both James and David had dropped two shots on the way out and despite level par back nines were not quite able to match Adam’s clubhouse score, resulting in an excellent win for the young BB & O Junior Golf Squad member. The BB & O Seniors Championship was played at Henley Golf Club on Monday 20th and Tuesday 21st May. 86 players aged 55 and over contested the Championship over two days, luckily, in quite pleasant weather conditions. Day one saw David Lane (Goring & Streatley) playing his usual steady golf making plenty of pars and few mistakes. He led the field by just two shots from Ian Hunter (Maidenhead) with Peter Franklin (Stoke Park) and Peter Godfrey (East Berkshire) just one shot further back. The second day scoring average improved slightly as players got to know the course. 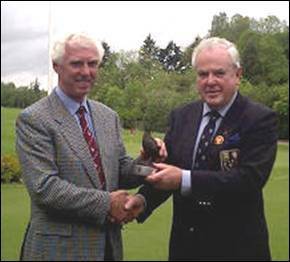 Brian Berney (Gerrards Cross), himself a four time winner of the Championship, posted a 75 to set the mark of 152 for the others to match. It was left to the second last threeball to battle it out for the title and despite an excellent 72 from Peter Bent (Ellesborough) and a 75 from Ken Proctor (Burnham Beeches), David Lane’s experience showed once again, and he scored a comfortable 74 to take the title by 5 shots for a record fifth time. Ken Proctor had the satisfaction of taking his Age Group trophy and both Ron Nightingale and Geoff Barlow had identical scores to win their respective Age Groups. The Handicap event was keenly contested on day one but Nigel Franklin (Buckingham) eased home after a fine 67 on day two to win by 4 from Mick Morris (Ellesborough) and Jim Gregson (Gerrards Cross). Burnham Beeches took the Team Prize beating Ellesborough and Gerrards Cross by 3 shots. Everyone enjoyed the event and the excellent catering provide by the Host Club. 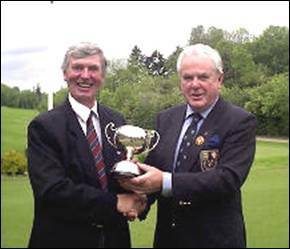 David Lane (Goring & Streatley) receives the Seniors Trophy from Bob Stewart. Ken Proctor (Burnham Beeches) receives the 55-59 Age Group Trophy from Bob Stewart. 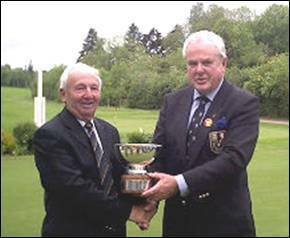 Ron Nightingale (Frilford Heath) receives the 65-69 Age Group Trophy from Bob Stewart. Geoff Barlow (Frilford Heath) receives the 70 Plus Age Group Trophy from Bob Stewart. The BB & O Amateur Championship was played at Beaconsfield Golf Club on Friday 14th & Saturday 15th June. 60 players competed on the Friday for 16 places (and ties) for the final 36 holes on Saturday. In good conditions on Friday morning 10 players broke the par of 72 with Richard Clarke (Beaconsfield) leading the field by 2 shots, 6 other players were at par or 1 over and it was difficult to predict what the cut would be. The afternoon saw the breeze pick up but another 6 scores would come in under par. Excellent scores of 68 came from Ashley Walton (Frilford Heath) and Tom Lawson (Ellesborough), whilst Mark Housego (Gerrards Cross) added a 69 to his morning 72 to lie in joint second place with Paul Heselden (Harewood Downs) who had another sub par round and had the satisfaction of achieving the biggest handicap reduction of 0.7 on the Friday. Paul and David Summers (Oxford City) would be the only two qualifiers from the Penfold Trophy to make it to the second day as the cut fell at 148 and 16 players went forward for another 36 holes on Saturday. Ashley Walton at 6 under par led by three from Paul Heselden and Mark Housego with 4 others under the par of 144. Scores on the Saturday morning rose quite sharply as a tricky wind blew up. With nerves also playing a part for the leaders, the best scores came from further down the leader board with David Addison (West Berkshire) adding another sub par round despite starting and finishing with a double bogey. Defending Champion Clive Bowler (Oxford City) and County Captain Matt Briggs both had level par rounds but looked to be too far back to be in contention for the fourth round. Ashley Walton’s steady 73 maintained his three lead shot with David Addison now in second place. Tim Whittaker (Beaconsfield) who had continued his exceptionally steady play was in third tied with David Summers. Craig Buttivant (Gerrards Cross) and Tom Lawson both had 71’s in the afternoon but were unable to post a total that would threaten Ashley as he was playing very steadily and the gap after 9 holes still saw him holding a three shot lead. Tim Whittaker finished in fine style completing the back 9 in three under and posted a level par total of 288 to set the mark. Ashley could not make any mistakes and 6 pars on the back nine looked enough, but just for good measure he finished brilliantly with birdies at 16 and 17 and a par at 18 which saw him take the title by the comfortable margin of 4 shots. He will now go on to represent BB & O in the County Champions Tournament at Woodhall Spa at the end of September and we wish him well in this Tournament. 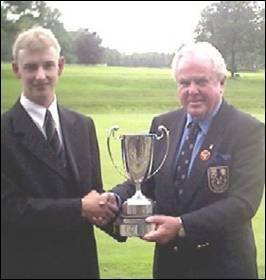 Ashley Walton (Frilford Heath) receives the Amateur Trophy from Bob Stewart. 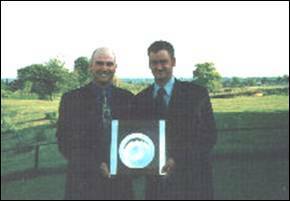 The BB & O Champion Club Scratch Team Finals were played at Tadmarton Heath Golf Club on Saturday 20th July. The event is contested by the top 12 Clubs qualifying through the June Medal round played at their home course. This final format is the best two medal scores from three counting both morning and afternoon. 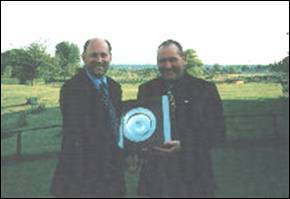 The leading Club goes on to represent BB & O in the English Champion Club Tournament being held at Northamptonshire County Golf Club on 6th & 7th September. The morning finished with four clubs very much in the running, Frilford Heath were leading on 1 under par with The Oxfordshire 5 behind and Sonning and Harewood Downs just one shot further adrift. The County Champion - Ashley Walton (Frilford Heath) and Tom Lawson (Ellesborough) had the equal best morning rounds of 67, closely followed by Simon Maynard (Sonning) who had also played very well for a one under par 68. With a five shot lead from the morning Frilford Heath would be difficult to overhaul and as the afternoon scores came in Harewood Downs posted the early mark of 284. Shortly after, this was overtaken by Sonning after Duncan Forbes, a member of the BB & O Seniors Team, shot an excellent 69. Another sub par round from Tom Lawson then gave Ellesborough a total of 282 which would just fall short as the Frilford Heath team of Bob Mann, Barry Mann and Ashley Walton had three more excellent rounds to finish with a total of 280 and to win by the narrow margin of 2 shots. Interestingly, the strength of their side would have resulted in an eight shot win had all three scores counted all day, so they were deserved winners. We wish them luck in their attempt to become English Champion Club later in the year. Played at Mentmore Golf & Country Club on Friday 31st May. 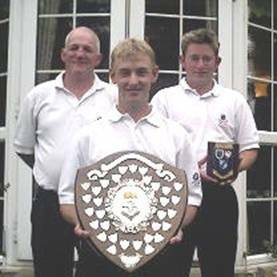 Our Team of 6 players were John Cronly (Frilford Heath), Kyle Cullum (Mentmore), Luke Hawkins (Mentmore), Barry Mann (Frilford Heath), Andrew Mason [Captain] (Tadmarton Heath), Peter Lane (East Berkshire). The format is 5 scores from 6 count from each round. Competition Scratch Score was 73 both morning and afternoon. Our players were lying equal 8th, 16 shots off the pace, after the morning round with the best score coming from Barry Mann with a 72. A much better effort in the afternoon saw us climb up slightly. Only 1 other County bettered our combined afternoon scores. Our total of 759 left us in 5th position. Played at Rye Golf Club on Saturday 6th July. Our Team of 6 players were Steve Barwick (East Berkshire), Matthew Briggs (Frilford Heath), Kevin Freeman (Stoke Park), Geoff Harris (Reading), Tom Lawson (Ellesborough), Stephen Lewton (Woburn). The format is for all 6 scores to count from each round. Competition Scratch Score was 70 in the morning and 71 in the afternoon. Our players were lying equal 4th after the morning just 6 shots off the pace with the second best score of the day coming from Geoff Harris with a fine 66. We hoped that we would be able to pick up the 6 shot deficit and successfully defend our title but despite 3 more scores under 70 in the afternoon we eventually finished third, 7 shots behind the winners Hampshire and 4 behind Kent the runners-up.